Mustard-Glazed Root Vegetables - A recipe from Savor California, the online showcase for extraordinary gourmet foods and beverages from California. Remove roots, tough outer leaves and tops from leeks, leaving 4 inches of dark leaves. Cut diagonally into 1-inch slices. 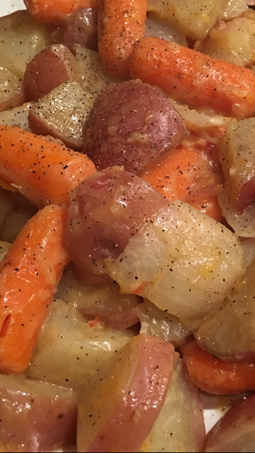 Place leeks, carrots, potatoes and onions in a foil-lined 10" x 15" baking pan. Stir together butter and olive oil, garlic, salt and pepper. Drizzle over vegetables; toss to coat. Bake at 400 degrees for 45 minutes or until tender, stirring once. Stir together mustard and chutney; spoon over vegetables and toss to coat.